Aryeh Deri met with Shas activists on Tuesday without his fellow party leaders Eli Yishai and Ariel Atias in a step regarded by some as an attempt to claim ownership of the party. 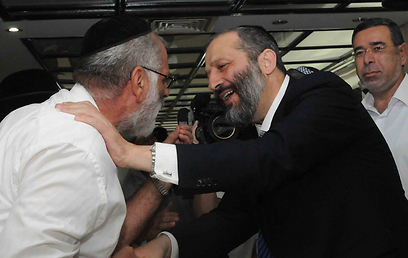 During the conference, Deri told the activists that Shas will be courting the Arab vote. Yishai on his part met with Prime Minister Benjamin Netanyahu to discuss the African refugee issue. Deri met with 400 field activists in a Tiberias hotel in an effort to "fire up the base." This is the first such conference the party has held since the Knesset elections were announced. "We need to bring in new audiences," Deri told the activists. "The only audience I know that can be mobilized are the weaker sectors within the Mizrahi community." But Deri also introduced a new group of prospective voters – Israeli-Arabs. "According to polls we've been conducting there is great sympathy within the Arab sector," he said. "We will take care of those who have less. They want to safeguard their heritage as we want to safeguard ours. I hope we can help them as we help others." His words were met with thunderous applause. Deri added, "The most important thing for me is unity. It pains me to hear of disagreement." He then promised to hold "a very big conference" with Shas' spiritual rabbi Ovadia Yosef. Also Tuesday, former Shas chairman Eli Yishai met with the prime minister. The two reportedly discussed the African refugee issue with Netanyahu expressing full confidence in the interior minister. Yishai himself noted that he was invited to the conference in Tiberias but could not attend because of his meeting in Jerusalem. Meanwhile, Housing Minister Ariel Atias met with Rabbi Yosef and informed him of bids to build 1,213 new housing units in east and north Jerusalem. Commenting on Deri's decision to hold the conference without the party's two other leaders, one Shas source said, "There is no effort to undermine anyone. As part of the division of responsibilities, it was decided that Deri is in charge of the election campaign and that includes communicating with activists. Deri will be organizing all future activist meetings as Atias will manage hasbara efforts and Yishai the Election Day headquarters." See all talkbacks "Shas' Deri eyes Arab vote"